Hello there! This is first post here on Game of Travel, so I’d like to introduce myself. I’m 35 years old. Polish, and I paint and collect miniatures. I’m not pro painter but I do my best and with every painted miniature I got more experience. When I paint miniatures is relaxing me. I can paint for hours and forget about everything, and simply focus on one tiny piece of metal, plastic or resin in my hands. The point is, that half of the year I travel with my wife across the world. I don’t have the access to fresh released miniatures, I can’t buy new brushes and paints, so I need to plan ahead. Right now I’m writing this post from hotel room in Puerto Viejo, Costa Rica.This place is awesome! little town in the middle of jungle with one of the best beaches in Costa Rica, but no possibilty to resupply. 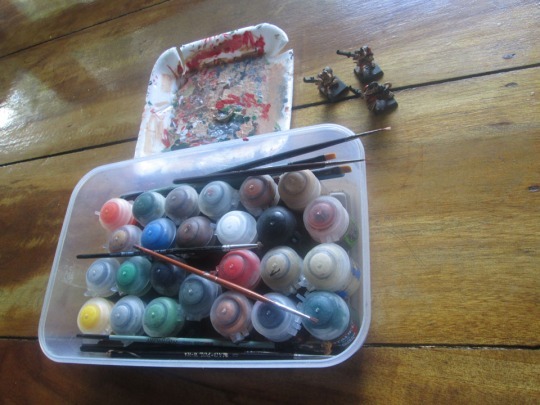 In my backpack I have around 20 miniatures, 20 Citadel paints and bunch of brushes – kind of portable workstation. For next few months it will be my only stock – the nearest wargaming store is Mexico – almost 2000 km. So it’s a challenge I’d really like to take. I’d like to paint more, but I can’t pack my luggage with gaming stuff only . I need clothes and cosmetics too:) Lucky for me and my desire for painting I’m back in Poland in May 2015, and there I will have endless possibilities. Tones of miniatures and war games to play. Ok, enough about me:) I hate opening posts, they are kind of boring… What I’ll be posting about here? Mostly stuff about gaming and miniatures. Some of my miniatures, but also some of things I stumble upon in internet, and thoughts about wargames. I think the blog itself is going to evolve and after few posts I’ll have exact idea, which direction it is going. One thing is sure, it’s going to be fun:) Just follow me, and we all see, how it is working. Cheers! This is my portable workstation. Painting set of Citadel Paints, with company of 3 Warhammer Skaven Stormvermin. Next PostTotallly unexpected post – Warhammer End Times: Vermintide!